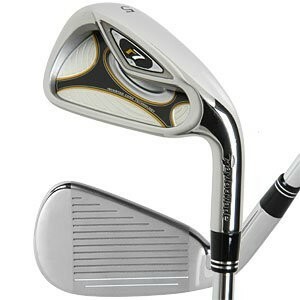 Here is a nice set of game-improving irons. The first thing I noticed is the modern-looking design: a cavity back design with a notch over the sweet spot. The inverted cone technology expands the COR Zone. COR is the trampoline effect that you get off of the clubface. This will give you more ball speed from a much bigger sweet spot. The iron has a moderate offset which will help the higher handicapper close the clubface at impact and give you more control as you get better. I would recommend these irons for the high to middle handicappers that are looking for a large cavity back design that will give you confidence and extra ball speeds off of mishits. I also would recommend you check out the Adams Idea A7s and the Wilson Staff D-FY. Both of these sets are really great irons for improving your game and helping you get the most of your golf game as you improve your skills.